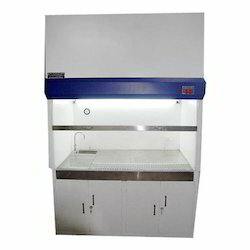 “Bio-cleanair”™ Wet Chemical Vertical Laminar Airflow Workbench is having Class 1000 clean environment inside the workbench, which will be achieved through two-stage filtration of indoor air, via- a set of primary filter bank of 10 micron rating and a set of final HEPA filter bank of 0.3 micron rating. The airtight construction of the cabinet ensures no cross contamination or reverse flow of air takes place. The cabinet and structures are made from electro-Galvanized Iron with Polyurethane paint coated finish and inner work area will be covered with 10 mm thick Polypropylene materials. Our company holds specialization in manufacturing, supplying, retailing and exporting premium quality Wet Benches For Nanotechnology . These workbenches are manufactured under strict supervision of experts using supreme quality raw materials. Before the final dispatch, our offered products are stringently checked by our team of quality controllers. These workbenches are highly demanded by the clients. Looking for Wet Benches for Nanotechnology ?